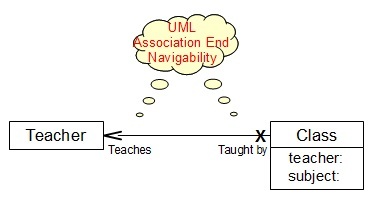 This section describes the Association End Navigability Notation used in a UML Class Diagram. An Association End Navigability Notation specifies whether or not the instance of the connected class can be easily accessed through the related instance of the opposite class. An Association End Navigability Notation is a graphical notation used in a UML Class Diagram to specify whether or not the instance of the connected class can be easily accessed through the related instance of the opposite class. Navigable Association End - A line arrow is added on the association line near the association end. Not Navigable Association End - A cross sign is added on the association line near the association end. Note that an association end may have unspecified navigability. What Is a Class Diagram?